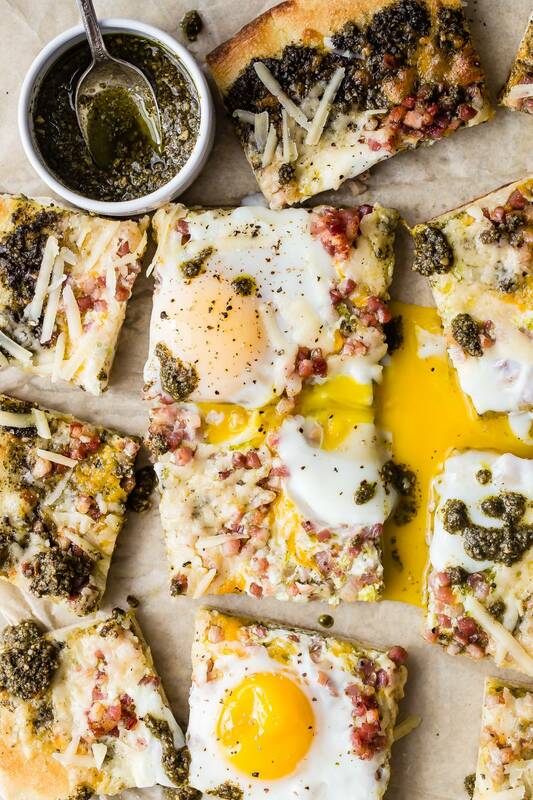 Throw this easy flatbread on the grill and top with crispy Pancetta and soft eggs! This must be the easiest and tastiest appetizer I’ve made in a long while because who doesn’t love minimal ingredient recipes? 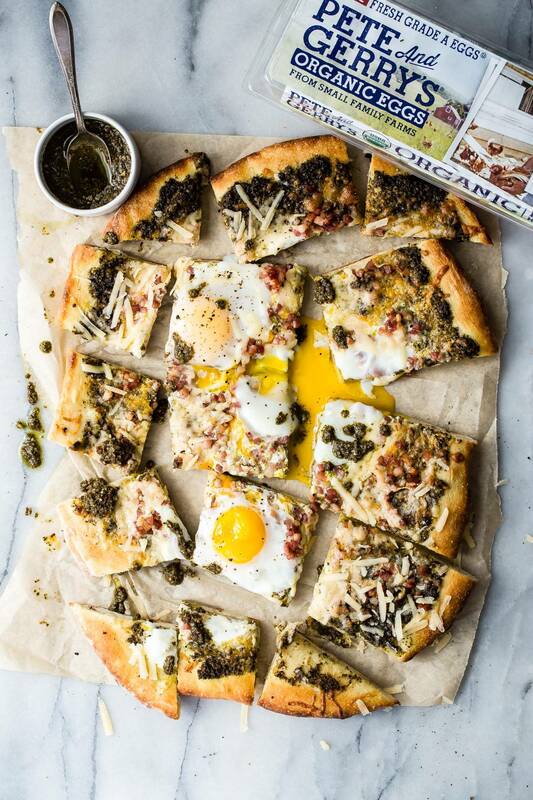 I suppose you could call this a breakfast flatbread but it could be eaten at any time of the day, it’s that good. This is also a recipe for keeping things real and being okay with not making dough from scratch or even fresh pesto, though if you have a recipe you love and some extra time, go for it. But, my point is that there are so many great fresh pesto brands available, as well as pizza dough which I use for the flatbread. It’s okay to cut yourself some slack on a hot summer’s day or when you have a bunch of friends over for dinner. Is there a difference between a regular pizza and flatbread? You could probably argue this for days but I don’t think so. Whether its pizza or flatbread, it’s not going to last for more than five minutes. You’ll need a pizza stone to place on the grill or you can even grill pizza right on the grill! I have a rectangle pizza stone which gives you those nice squares, but you’ll get the same, delicious grilled taste without the stone as well. 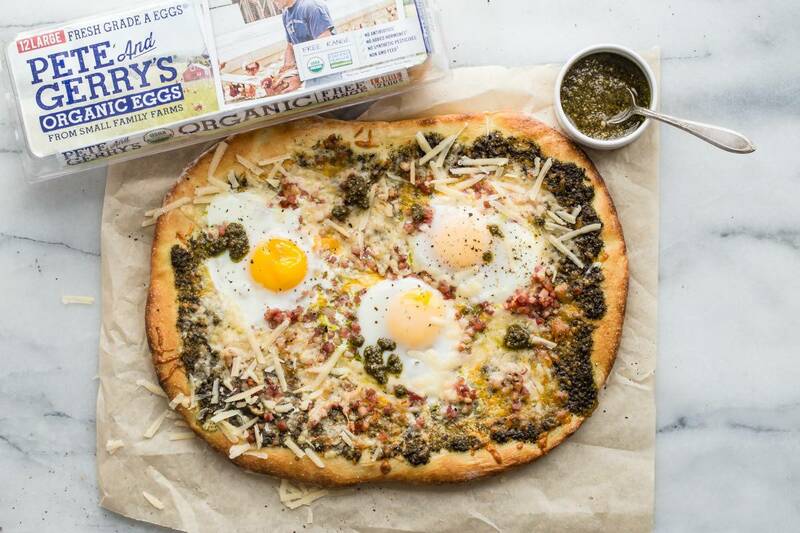 Have you ever had flatbread with eggs on top? You might think that only a few people would get to taste the egg because it’s not all over the surface of the bread but once you start slicing and those golden yolks pop open, everyone should end up with some egg to taste. I always use Pete and Gerry’s Organic Eggs because the yolks are bright yellow and they taste like an egg should taste, delicious! They are sourced from small family farms and the quality shows. That’s one of the benefits of buying organic eggs, Pete and Gerry’s farmers let their hens roam free in a relaxed environment and this plays a huge part in how good the eggs will taste. It’s a no-brainer if you think about it. A hen cooped up in a cage all day long just won’t produce the same high-quality egg as a Pete and Gerry’s egg. Eggs on grilled flatbread- It’s a must do for this summer! 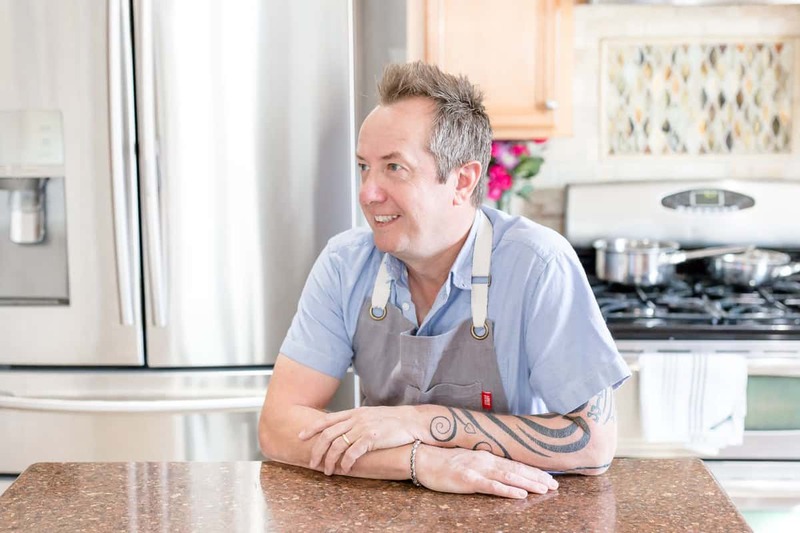 Don’t forget to follow me on Pinterest, Facebook, and Instagram for more recipes and updates! You can also follow Pete and Gerry’s on Instagram for more egg ideas too! (For those using a pizza stone) Preheat your grill to high and place your pizza stone on the grill, let the stone heat up for at least 10 minutes. (For those grilling directly onto the grill) Preheat your grill on high and let heat up for at least 10 minutes. Dust a large baking sheet lightly with flour and place the dough onto it. Grill for about four minutes until the dough starts to puff up. 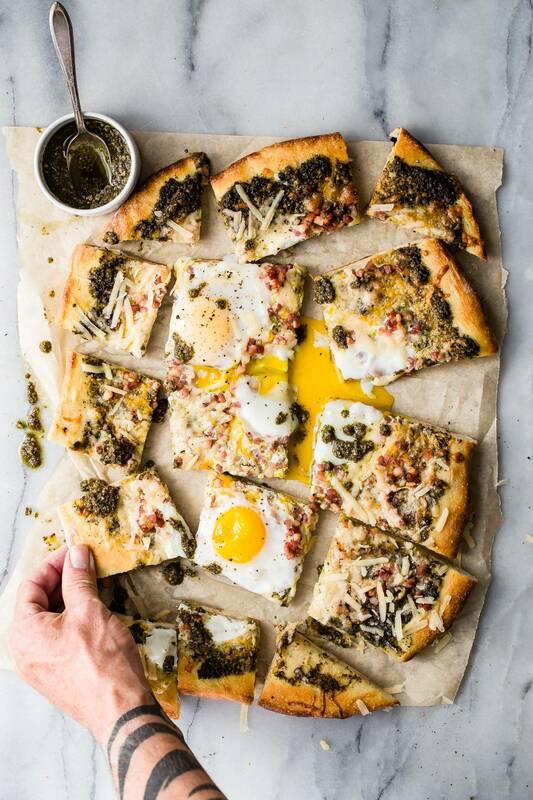 Spread the pesto over the flatbread and top with both kinds of cheese. Crack each egg gently onto the flatbread and slide back onto the pizza stone or directly onto the grill. This has Sunday brunch written all over it! What a beautifully rustic pizza with to die for flavors! Love a grilled flatbread! 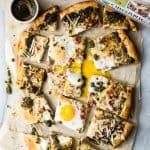 I just love egg on pizza or flatbread! Delicious! Oh that runny egg!! I am also a sucker for anything with pesto. This deliciousness needs to happen asap! What a great summer appetizer!